The AIFFA logo (left) and scenes from Vietnamese movies 'Co can nha nam nghe nang mua' (top right) and 'Song Lang' are seen in this photo collage. Two Vietnamese entries made the shortlist of films to be screened at the 2019 ASEAN International Film Festival and Awards (AIFFA), according to an announcement made by the festival’s organizers on Tuesday. 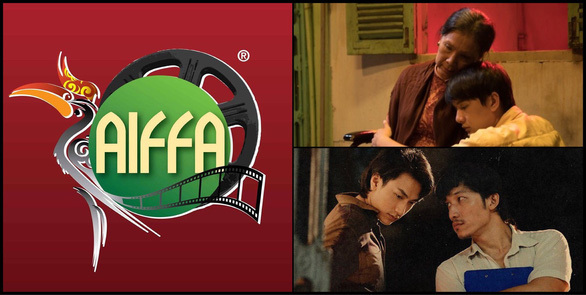 The fourth edition of AIFFA will run for three days, from April 25 to 27, in Kuching City, Malaysia, featuring Hollywood actor Steven Seagal as the celebrity guest of honor, a privilege previously enjoyed by the likes of Jackie Chan, Michelle Yeah, and Nora Aunor. This year, awards in 16 categories will be contested by 29 entries from Vietnam, Malaysia, Brunei, Singapore, Indonesia, the Philippines, Myanmar, Cambodia, Laos, and Thailand. Song Lang by director Leon Quang Le and Co can nha nam nghe nang mua by director Mai The Hiep will represent Vietnam at the festival. Song Lang depicts an unlikely bond that forms between an underground debt collector and a cai luong (Vietnamese folk opera) performer against the backdrop of Ho Chi Minh City in the 90s, while the other Vietnamese entry tells the story of an old woman haunted by memories of the mysterious death of her son from decades ago. The biennial AIFFA was first initiated by Malaysia’s Sarawak Tourism Ministry in 2013 with the aim of motivating filmmakers in the region and promoting the ASEAN film industry to the international market. In 2017, Dao cua dan ngu cu (The Way Station) represented Vietnam in the festival and won three of the eight categories for which it was nominated, including Best Picture, Best Actor, and Best Director.